The HPS Network and community celebrated togetherness at the 26th Annual HPS Network Conference, held March 8 – 10, 2019 at the Long Island Marriott in Uniondale, NY. 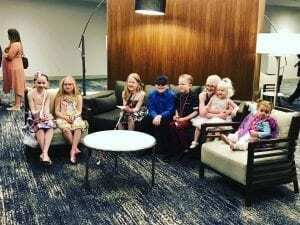 Themed, “Life is Sweet When We Are Together” the event attracted approximately 300 people affected by the Hermansky-Pudlak Syndrome (HPS) type of albinism, their families, physicians, interested researchers and supporters. Attendees shared stories about living with HPS, listened to medical experts explain key points of the standard of care for someone with HPS, explored various ways to become better advocates, got updates on the latest HPS research and spent time simply having fun together. Mothers with children affected by HPS kicked off the weekend with the Mother’s Workshop given by Sheila Adamo, LCSW, CADC. “As a mom, my favorite offering at the conference is the Mother’s Workshop. Sheila is an amazing facilitator, and having a safe space to talk about ourselves, our rare kiddos, and the different challenges moms face, is invaluable,” said Becky Nieves. The rest of Friday was filled with sessions explaining the genetics of HPS, a legislative advocacy session and a special greeting for attendees and physicians from Puerto Rico. Finally, Donna Appell, Founder and Executive Director of the HPS Network, capped off the day with her annual Year in Review. It’s a chance for the HPS community to meet together and learn what the HPS Network has accomplished during the past year. Meanwhile, Friday evening, the kids held their annual HPS Dance Party and afterwards, family bingo games. During the afternoon attendees chose from a variety of sessions ranging from laughter yoga to how to speak to children about their HPS. In another area 46 researchers, all working to solve the mysteries of HPS and find better treatments, attended the Meeting of the Minds. They discussed subjects ranging from gene therapy for HPS, to other potential therapeutic targets to bioengineering technology that might one day help to deliver future treatments. The children were treated to a visit from the Big Apple Circus on Saturday. They watched a private performance, and then had the chance to learn how to do some of the tricks in the act. They also got a visit from Dr. McStuffins who explained how easily germs can be transmitted and how to avoid getting sick. They also had a cupcake decorating contest and a pool party. Saturday evening the community gathered for the “Sugar Ball,” the annual dinner. The HPS Singers provided entertainment in between eating and awards. Then, families and physicians danced the night away. Other presentations included information about how to prepare for a lung transplant, how to handle bleeding complications and information about the gastrointestinal complications that can come with HPS. “We all had tears in our eyes when we said our goodbyes. This group of strangers have become more than my friends – they are now my family,” said Jill Pounders, a first-time attendee.